I'm a little embarrassed to admit it, but I don't have any heavy, oven-safe pans. 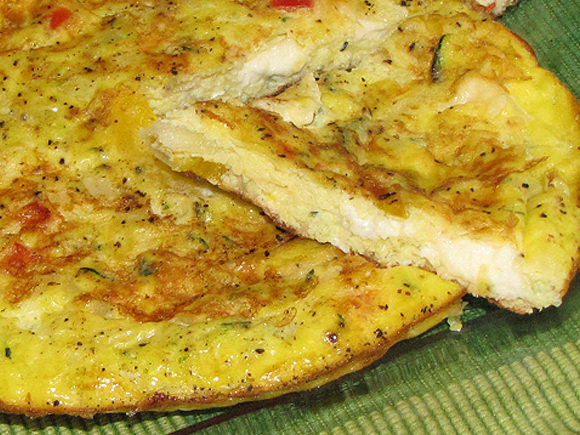 You know, the ones that are perfect for making a frittata. The ones that the Food Network tells you to use. Well, since I don't have those pans, I've created my own little, stove-top version. And you know what? It was awesome. Who says you can't have the good stuff with the easy stuff! All you have to do is cook it in a small pan over low heat and you're eggs will be set in about 15 to 20 minutes. Not that much longer than if you were to use an oven to finish the cooking. 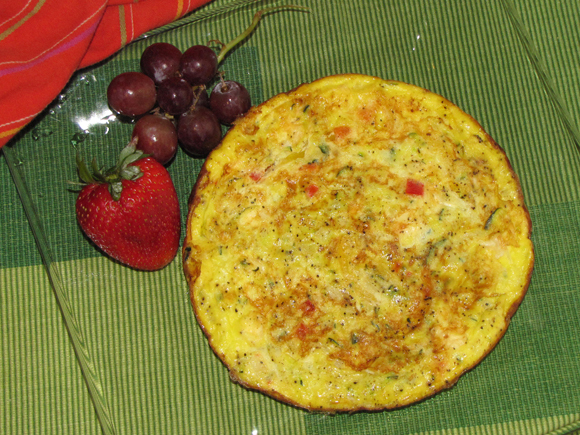 In this frittata, I used a yellow pepper as the main pepper in mine, but added a tiny bit of red pepper for color. (I love all peppers and use them whenever I can!) Since frittatas are an empty canvas though, you can replace any of the vegetables or cheese with your favorites. You may have to adjust the cooking time a bit depending on the ingredients you use, but the technique will stay the same. 1. Beat eggs together in bowl and add all remaining ingredients except feta. Mix well. 2. Fold in feta cheese. 3. Spray small, non-stick pan with cooking spray and heat over medium heat. 4. Once pan is hot, pour in egg mixture and reduce heat to med-low. 5. Cook for about 7-10 minutes or until bottom is starting to lightly brown. 6. Reduce heat to low and cook for another 3-5 minutes or until eggs are almost set in the center. 7. Carefully flip the frittata (or invert onto a place then carefully slide it back in the pan) and cook for another 3-5 minutes or until eggs are set.